Enhanced user experience, introduction to video headers, simplified user interface, REST API… what next? In span of 13 years, WordPress has evolved from a blogging platform to a fully fledged CMS. With each new version, it is getting better and better. And obviously it has a lot more in store for 2017. 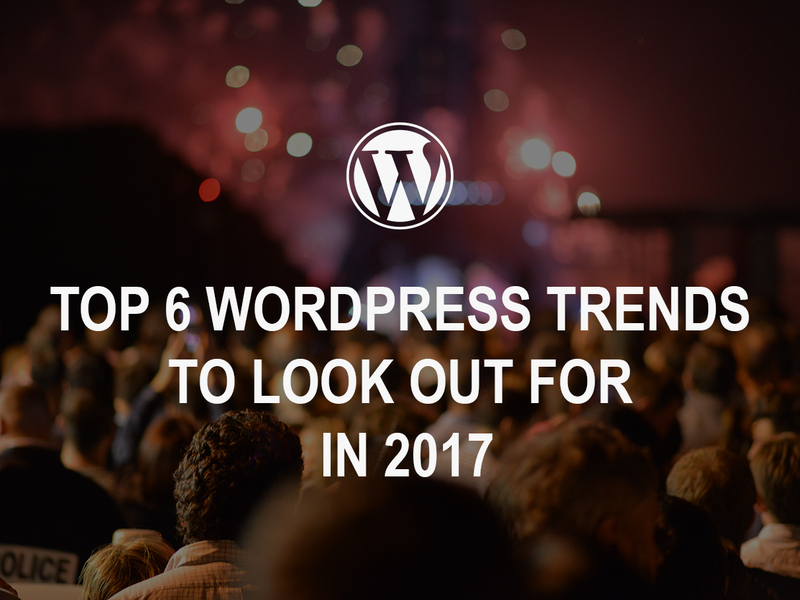 Let’s take a look at WordPress trends in 2017. We all are aware that mobile phones are the preferred platform for browsing, online shopping, social media etc. Many experts have highlighted that more than 50% of search on a global level comes from mobile devices. So, it is very important that to gain user’s trust you have to create a friendly environment for them. That’s exactly where WordPress is heading. We have already seen a rise in responsive webdesign implementation. But the ecosystem is changing. The focus is now on “mobile first” — for design as well as for indexing. Secured environment is a norm that all website owners vouch for! However, there are incidents that leads to cyber-crimes and cause collateral damage. WordPress is aware of this and has been taking stringent steps to serve more secured environment. HyperText Transfer Protocol (HTTP) is unencrypted by default and Hyper Text Transfer Protocol Secure (HTTPS) is the secured version of HTTP. Secured because the data that has been exchanged between your browser and website is encrypted. WordPress has upped its efforts to the core to make their websites secured. 2017 is going to be a interim year for site owners as well as for hosts. Here’s a quick tutorial to get you started with SSL / HTTPS on your WordPress website. There a lot of niche-specific as well as multi-purpose themes in WordPress market. There are more and more multi-purpose themes with a gamut of features which allow you to build any kind of website. Theme options and settings allow you to customize the themes to no end. To add to it, VR optimized themes are also trending in the market though they are closely associated with gaming industry. WordPress has already taken the advantage by supporting VR images and videos. Though this concept is not new for some developers, thanks to WP-VR-view plugin but it will definitely see a rise in the future. While Software as a Service is not a new concept. Many themes and plugins have already successfully implemented this model. And looking at its popularity, it is no doubt that there will be a rise in SaaS model. More and more premium theme and plugin developers are inclined towards offering their products and services as subscriptions. The services will be auto-renewed at the end of a term. It’s a win-win situation for both developers and users because developers will earn continuous revenue and users will enjoy continuous support and regular updates of the software they are using. Video headers aren’t new because the trend has already been set by WordPress theme – Twenty Seventeen. Gradually, developers are becoming conscious about the popularity of videos. Adding any video content creates waves on overall performance. And the same performance is expected from video headers too! Taking into account the video size and quality, the popularity will definitely urge developers to design optimized themes in the future. WordPress websites are already a hit in the eCommerce circuit. It is one of the most wannabe thing for a user – thanks to Woocommerce. The acquisition of Woocommerce by Automatic was a clear indication that WordPress is serious about diving deep into e-commerce market. And so far it has been a successful story. Is anything missing on the list? Share the upcoming WordPress trends that you’re excited about in comments.